The theme I am currently using is actually a slight variation of Content Cream, but this one is more traditional. Here are some of the features of Content Cream. AdSense ready – You can put you two AdSense ad blocks in very prominent places. If you blend your ads (as shown in preview) with the background, they’ll appear to be a part of your content. Widget ready – Though I prefer not to use widgets because directly modifying the code gives me much more control over customization. Pretty Icons – Some pretty icons here and there to guide the eyes to the right places. A feature box – A featured box right under the navigation bar that can hold three items of your choosing. Other than that, this is a very minimalistic and content-oriented theme. Do you have a suggestion or an idea to improve Content Cream? Please leave it below in the comments. Built on top of Upstart Blogger Minim. Icon design by Jonas Rask. And thanks to Robert for urging me to make Content Cream available for download. If you want to leave the credit in the footer, that’d be great! The theme looks nice and professional . I will give it a try . Content Cream is beautiful! Very nice colors. Great job! And thanks very much for keeping the link to Upstart Blogger. 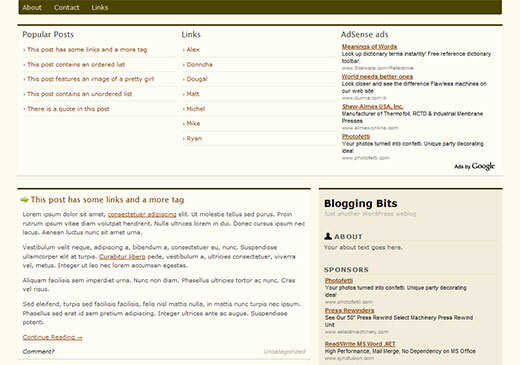 I’ve added a mention on the WordPress Theme: Upstart Blogger Minim page. Woohoo! Awesome Mohsin! I’ll pass it around. Robert @ Upstart Blogger, I believe in giving the credit where it’s due Thanks a lot for the mention on your blog. It’s a nice looking theme! Oh great, now I might have to start up a new blog, just to use this theme… I like the way it makes good use of the top space above the fold, and breaks out of the usual WP look. Well done! Unusual layout and lovely, soft colors. I love this theme! Linda, thanks a lot. I hope to keep all my future themes usable, light-weight, and unique. And if I am not mistaken, all three of you are ladies, right? I like the simplicity of it. I agree with the earlier comment about wanting more blogs just to try out designs. My problem is it’s very hard to settle on one design. Very nice. The theme I have chosen for my blog doesn’t let me add anything to the top section and I’d like to make use of that as my titles tend to be quite long so when I put things like recent posts in the sidebar they end up stretching out the sidebar way down the page. I like the way you’ve spread out the various components making use of both the top section and the sidebar. Can i change a bit of your template?!!! I liked it i want to use this in my BLOGSPOT blog. U r welcome even if u dont give me permission!! Great theme. I just don’t like that big header. This is a wonderful theme! I don’t have any use for it at the moment, but I certainly will in the future. Thanks! Going to check it out. Thanks for sharing. Much appreciated. Лучшие темы для nokia. Отправь смс и польщьзуйся темой. Автор молодец, 100% адекватно все воспринял. Суперский рассказ и автор молодец! Привет! Случайно попал на Ваш блог. Я с Вами в чём то согласен, а в чём то нет. Время идёт и совсем скоро Новый год… Вот тут нашёл место, где можно написать письмо Деду Морозу. Мелочь а приятно, ведь скоро Новый год. Время когда наступает пора загадывать желания. Спасибо за блог. I’ve been using this theme for about a couple of weeks on a test site of mine. it is perfect. Quite fast. Nice share. It was a nice theme & it looks great . I really love it & inspired with its soft & lovely colors. And also the layout is looking great with its difference. Thx for sharing this nice theme through your posting. Take a look at this site where we offer wordpress themes for free. And also get some more inspiration on best CSS sites available on the net & for the free wordpress themes and free PSD files. Really enjoyed this article, how can I make is so that I receive an alert email when you publish a new post? My coder is trying to persuade me to move to .net from PHP. I have always disliked the idea because of the expenses. But he’s tryiong none the less. I’ve been using Movable-type on a variety of websites for about a year and am worried about switching to another platform. I have heard good things about blogengine.net. Is there a way I can import all my wordpress content into it? Any kind of help would be greatly appreciated! Admin: If you sell advertising on your website don’t use Adsense. They take 32% commission. Use http://www.adsales.ninja they have much lower commission and doubled my website revenue. Much, much better than Adsense. Our personal winter months are unquestionably valuable and therefore arctic. I try to be in the yard taking walks and then shoveling winter when needed. I absolutely need definitely style Brazilian curly hair, and has looked for ages to purchase people. There are good. which you can select the one which is best matching your needs. Before selecting them, as a car owner you must observe your car interiors to make sure where they should be installed. You can install them at different places such as backseats, front part of your cars, between the seats and on the roof according to your choice and comfort by considering different factors in mind. After visiting reputable online sellers, you can buy car DVD players by paying wholesale price online and can save hundreds of dollars expected from retailers. ?Thoroughly clean the site and let it dry naturally. |What’s up, is it rite to only study from publications not to pay a visit web for newest updates, what you say friends? It is essential to use baby oil or water to make the dressing soft when the set is going to be taken out. Maintain the tautness of the skin when the infusion set is removed. Monitor the old insertion site to ensure that it is healing. You should not reuse a used infusion set. Do not use the same site immediately when you are inserting a new infusion set. Such peruvian virgin hair https://www.youtube.com/watch?v=W9S-50bMe7E are quite style coupled with wonderful, actually good . I am really glad to glance at this web site posts which Release: Content Cream WordPress Theme carries plenty of useful facts, thanks for providing such data.